Delicious knots of spiced biscuit, Jumbles were a favourite Tudor treat. But can you make a batch without getting yourself in a twist? This week’s technical challenge is to make a batch of jumbles. Dost thou hereby accept the gauntlet? Excellent. All you need to do is follow the recipe below and then upload a photo of your divine (or disastrous) creation right here. We want to see it all! 1 – Line 2 baking sheets with baking parchment. Place the caraway seeds in a pestle & mortar and grind to a powder. Sieve the caraway, flour aniseed and mace together into a bowl. 2 – Rub the butter into the flour until it resembles fine breadcrumbs, then stir in the sugar and lemon zest. Add the eggs and bring the mixture together to form a soft dough. 3 – Divide the dough into 6 balls weighing 65g and 6 balls weighing 85g ( you might have a little left over). Place the dough balls on one of the baking sheets, cover with clingfilm and chill for 30 mins. 4 – Preheat the oven to 180C/fan 160C/gas 4. Knead the 6 pieces of dough (weighing 65g) on a lightly floured surface and roll using your fingertips into a 30cm rope. Knot into double knots. 5 – Shape the remaining 6 pieces of dough (weighing 85g) into Celtic knots. 6 – Using a palette knife, carefully lift the dough shapes onto the lined baking trays, spacing them slightly apart. 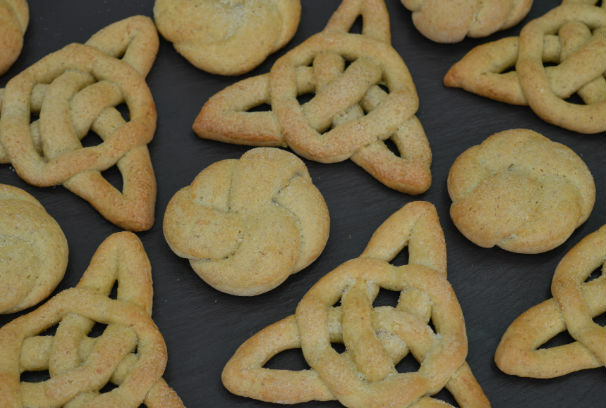 The double knots will take an extra 5 – 10 minutes longer to bake than the Celtic knots, so don’t mix shapes on the baking sheets. Brush with beaten egg and sprinkle with caster sugar. 7 – Bake the Celtic knots for 15 – 20 minutes, until golden brown and the double knots for 20 – 25 minutes. 8 – Remove from the oven and leave to cool on a wire rack.